Easily Prepare Fresh Herbs, Spices, Seeds & More. Spice it up with a twist. 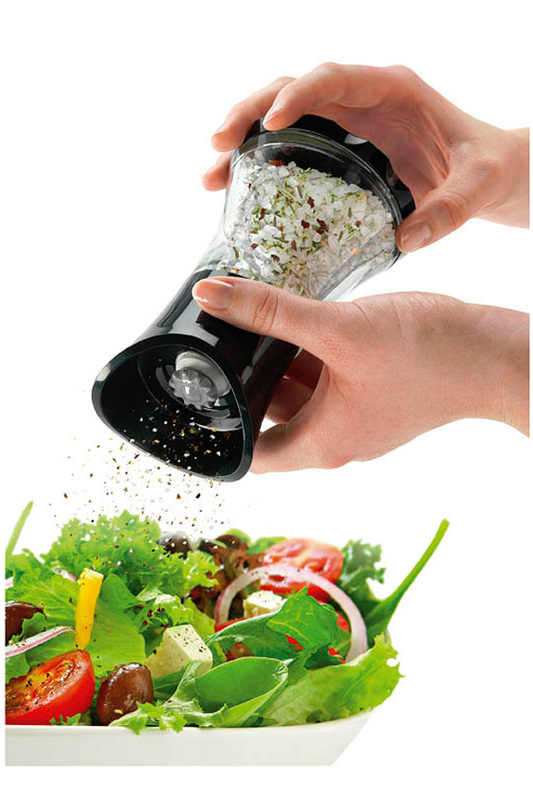 This versatile grinder is super easy to use, and it works great for all kinds of spices, herbs, seeds and even coffee beans. It's easily refillable, and has a glass storage container, so switching from one ingredient to the next is fast and simple. The grinding mechanism is made from a sharp and durable ceramic, so it's effortless to use, and guaranteed to last longer than stainless steel alternatives. Fully adjustable from fine to course, you are sure to get the results you want when using this tool. The wide grip makes it comfortable to hold, and a simple twist of your wrist is all that's required to operate it. All parts are completely dishwasher safe so maintenance and cleaning are easy. Ceramic. Sharp, long-lasting and rust-proof. The grinder on this tool will perform well and hold up through tons of use. Versatile. Fill with a single spice, or combine several to make your own mixes. Adjustable. Any size you prefer is easily attainable. A quick twist allows you to dial in the ideal size from fine to course. Ergonomic. Indentations and large sizing allow for a comfortable grip and easy turning action. Glass. Other products use plastic, but this high quality alternative is different. Preserve flavor and make cleaning and switching spices easy. This high quality gadget is fully adjustable, so a simple twist allows you to dial in the perfect setting, from super fine to coarse. The ergonomic finger grips at the base are comfortable to grasp and make turning it easy. A sleek design, high quality materials, and superior construction ensure many years of pleasurable use. This unit is great for salt, peppercorns, flax seeds, cloves, chilies, basil, oregano and much more. Enjoy fresh ground spices in an instant! Comes with a 25-year warranty and easily adjusts to suit your needs. So beautiful you'll want to display it on your table. So practical you'll want another next to your cook top. Buying whole spices and grinding them as needed is the best way to achieve a recipe's optimal flavor. Most of us only fill our pantries with ground spices though, because they're generally more convenient to use. 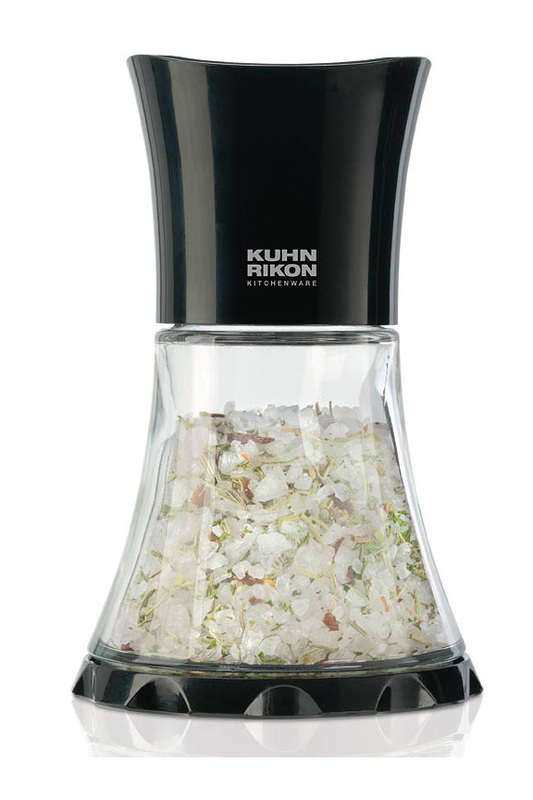 This great gadget from Kuhn Rikon makes it easy for anyone to add fresh ground ingredients to their food. A simple twist of the wrist is all it takes to quickly and easily grind your favorite herb or spice. Switching from ingredient to ingredient is easy too. Just pop one out and insert the next to change what you are grinding in seconds. Bolder, fresher flavor is easy to achieve when you use ingredients that ground as needed, so enhance current recipes, or try new ones with this tool. 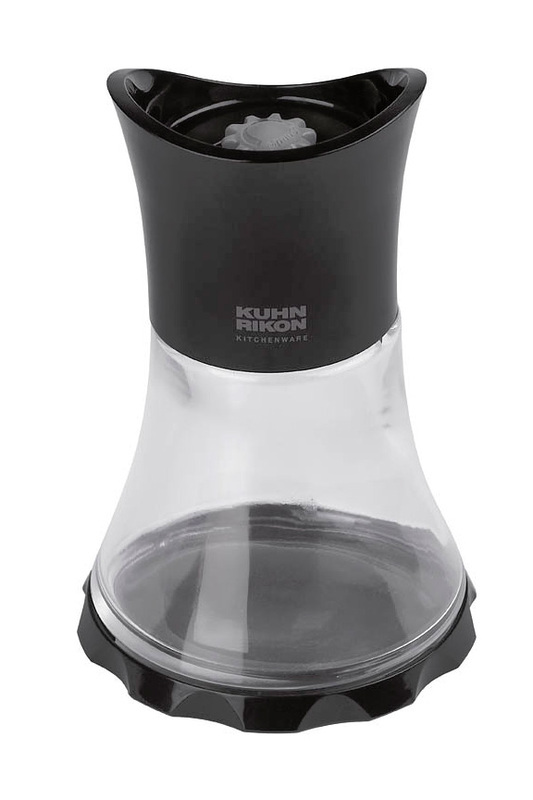 The Kuhn Rikon Vase Spice Grinder produces a perfectly uniform grind each and every time thanks to a fully adjustable grinder, and high quality construction. Designed to grind upside down, it helps prevent ingredients from spilling when not in use, and keeps your counters and cupboards cleaner without effort. Quickly add fresh flavor to a green salad, or spice up meat and other foods prior to cooking. Don't settle for the dull taste that pre-ground containers offer, and start cooking like a pro. Features a soft-touch Santoprene bottom with integrated finger grooves. Dishwasher safe. High quality materials and superior craftsmanship make this Swiss made kitchen gadget a must have. A great accessory for anyone that enjoys cooking. Discover the easiest way to grind and store spices. I had seen this item at my sisters home Christmas Day and was very impressed. When I received my order I was very pleased and plan to order more for different applications. Its great in every way, good sturdy construction of the item and really does the job, but it takes a full 3 minutes to grind out a Tablespoon, so while I will keep it I am also keeping my eyes open for one a little faster. Best grinder ever! Will grind rock salt chunks up to about 1/4 inch, and everything else I've tried. I won't buy anything else. Does a beautiful job of grinding pepper. 11.25 Inches. A High Quality Basting And Pastry Brush With Stainless Steel Handle.